The author discusses three essential components in discovering the sense of the meeting: release, long focus, and transition to light, all of which are nurtured by worship. Rich stories of life experiences, especially with adolescents, illustrate the process in a pamphlet that offers a true gift back to Friends. Barry Morley (1932-2000) taught at Quaker schools and worked with Quaker camps for much of his life. Born in New York City in 1932, he attended Harvard University, where he founded a Gilbert and Sullivan operetta company. Using the same operettas, he started a youth festival in Greenwich, singing tenor in several performances. He served in the army after graduation and directed a classical music choral group in Munich, which incorporated citizens of that town in addition to soldiers. Back in the States, he spent many years teaching at Oakwood Friends School in Poughkeepsie, New York, and Westtown School in Pennsylvania. His most noteworthy work occurred at Sandy Spring Friends School and Catoctin Quaker camp. Working with youth in Baltimore Yearly Meeting, he developed a sense of how to function as a camp director while allowing counselors the space to run the camp through Quaker process. This sense that Friends need to understand Quaker process as a spiritual practice that fits into everyday life is a main theme of Salvaging the Sense of the Meeting. 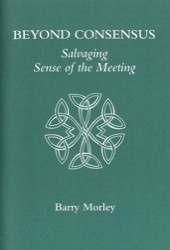 Barry Morley also worked with adults in Baltimore Yearly Meeting, offering them spiritual retreats with the Inward Bound program. These weekends of spiritual healing and contemplation served, and continue to serve, individuals in their spiritual growth and nurture.